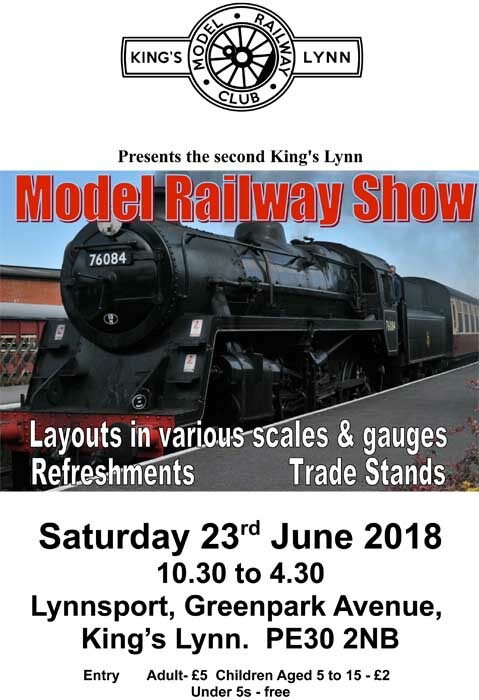 King's Lynn Model Railway Club is holding its second Exhibition on Saturday 23rd June between the hours of 10.30 and 4.30. Last years event attracted almost 500 visitors and their feedback has been noted. This year the event will be in the Main Hall at Lynnsport with its excellent facilities including better ventilation, parking and catering as well as full disabled access to all areas. The new larger venue means that as well as the Clubs own stand eighteen working layouts in various scales/gauges will be on display together with two modelling demonstrations and twelve trade stands selling assorted railway related products of interest to modellers. In addition the King's Lynn and District Society of Model Engineers will have their new track opposite the main building operating rides on their models and visitors to the exhibition providing proof of entry will be offered a discount on their normal charges.